Charm is inspired by a Dungeons and Dragons spell: Charm Person. When you cast this spell on someone, they automatically treat you as a friend. 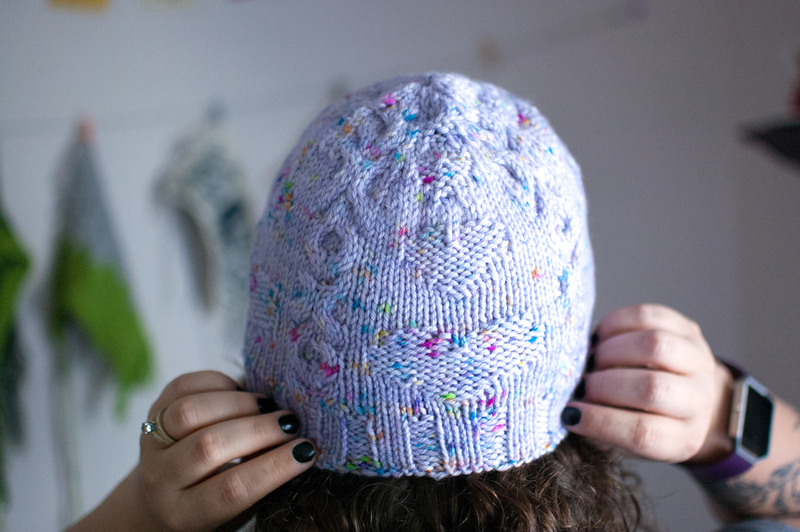 Cast this on your needles and be charmed by the cabled Xs and Os, and the sweet purled hearts that run up to the crown of the hat. Don’t be alarmed if people seem to start more conversations with you while wearing this hat, it’s just the effect of the spell! This hat is all about subtle texture and will become your favorite beanie to wear for all of your casual outings. Pick a solid color or speckled yarn to show off the textures (I don’t recommend variegated yarn as the colors will make the texture hard to see). Along with charming the pants off of everyone you meet, the cables and raised purl motifs in this pattern are engaging to knit but still simple enough that you could work on it during your next D&D campaign (but don’t because your DM will kill me for suggesting that — unless they’re super cool). 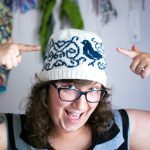 It’s a great project for dipping your toe into cables if you haven’t knit them before and the pattern includes a tutorial on the cables used to help you through.